Create an outright contrast between the two protagonists - Abigail Williams and Elizabeth Proctor. Examine how he has established this dichotomy of character, and what does it add to the dramatic quality and audience involvement in the play. The "Crucible" By Arthur Miller Miller attempts to create an outright contrast between the two protagonists - Abigail Williams and Elizabeth Proctor. Examine how he has established this dichotomy of character, and what does it add to the dramatic quality and audience involvement in the play. On the face of the play ("The Crucible") it seems to be simply about the mass hysteria which led to the 1692 Salem Witchcraft trials, which talks about a handful of issues which are somewhat remote to a modern audience, who in turn find it relatively intricate to relate to such happenings. But as you study the play in more detail you realise that Miller not only stresses issues which were easy to relate to in the time in which it was set, but has also given the play a modern touch by stressing the rivalry between Abigail Williams and Elizabeth Proctor. Consequently Miller adds to the dramatic feel of the play by adding a series of modern touches and historic statements which makes the play not only relate to the happenings of witchcraft but also explore the crime of adultery, which makes the play more about the personal guilt of John Proctor. The play furthermore creates the "Crucible" in such a way as to illustrate how people react to mass hysteria, created by a person or group of people desiring fame (in this case Abigail because she is the main leader of all the happenings that go on in the performance), as people did during the McCarthy hearings. The dramatist deliberately makes the two main female characters Abigail and Elizabeth two totally opposite women, highlighting the differences between the women during the whole play. Additionally he puts John Proctor in the middle of these two dominating characters to add to the drama and tension of the play. Miller always keeps questions going throughout the dramatic piece about John, Abigail and Elizabeth which include: which woman will John choose and go with? ...read more. Is Elizabeth right to carry a grudge against John, or do you think she should forgive and forget? Elizabeth has strong convictions and will not give in no matter what. 'An everlasting funeral marches round your heart,' this reinforces the idea that John is describing the house as a vile place to be. John does actually want to save his marriage but with the reactions he gets from Elizabeth he does not know what to do 'You forget nothin' and forgive nothin'. Learn charity, woman.' This quote adds to the tension in the play by making us wonder whether or not Elizabeth will ever forgive John. John is prepared to forget the affair with Abigail ever happened even though he still has feelings for Abigail (Elizabeth is aware of the fact that John still has feelings for Abigail 'If it were not Abigail, that you must go to hurt, would you falter now?'). On the other hand Elizabeth is not convinced the affair is over and that John is not being totally honest with her, for the reason he goes into Salem and comes home late 'You come so late, I thought you'd gone to Salem this afternoon.' Dissimilar to Abigail, Elizabeth lacks self-confidence, and knows that she is not neither attractive nor as young as Abigail. Elizabeth is an old, unattractive wife who is sometimes under estimated by people 'John I counted myself so plain, so poorly made, no honest love would come to me.' Elizabeth's character also finds it exceptionally hard to express her feelings, the opposite of Abigail who finds it easy to burst into tears whenever she needs to in the court room. It is only right at the end of the play when Elizabeth has finally enough courage to say exactly what she is feeling and when the audience see any kind of physical closeness (ironically it is when her husband only has a few minutes to live). ...read more. The dramatist purposely puts Abigail and Elizabeth at two ends of the scale. Abigail lives by lies and Elizabeth only ever tells one lie which sends her husband to the gallows 'In her life Sir she have never lied.' 'Answer my question! Is your husband a lecher?' This at the very end keeps you in suspense as to whether or not Elizabeth is going to say to the court that her husband is lecher which is a hanging offence. Elizabeth knows that John can be sent to the gallows if she answers honestly but she decides to answer 'No, Sir.' This ironically is the only lie she tells in her whole life and it condemns John to his death. It is also ironic that Elizabeth chose to lie because if she had not Abigail would have been uncovered as a liar. The dramatist deliberately does this to add more dramatic appreciation to the play. The contrasts between the two female protagonists contribute to the plays dramatic quality by illustrating a range of character. Miller uses the two possible extremes of a female's personality which adds to the drama of the play by keeping the reader hooked to see which female John will choose in the end. The play deliberately uses differences to show us as the audience that there are clear contrasts between Abigail and Elizabeth. Miller also composes the idea about religion verses witchcraft by introducing once more a contrast between Abigail and Elizabeth-Abigail is in an earthly court causing people's deaths and Elizabeth is in her own heavenly court which only she controls-. The issues which are brought up in the play makes the dramatic piece more relevant to today by making the play not only about the happenings of witchcraft but about the crime of adultery, which makes the play more about a love triangle between Abigail, Elizabeth and John. This allows us to be captivated throughout the whole play as to which woman John will finally choose! ?? ?? ?? ?? 1 By Sarah Biggs 10 Red ...read more. Prior to this meeting between Abigail and Proctor, we have seen Abigail in conversation with Betty and we learn that Abigail has had a disturbed childhood. She witnessed the murder of her parents. "I saw Indians smash my dear parents' heads on the pillow next to mine..."
Soon after, John, along with 19 others are hung. A few months later, the judges realise this is going too far; too many people will die, as hardly anyone will confess to their 'crimes'. Elizabeth Proctor, wife of John Proctor in The Crucible, Elizabeth is in her thirties, a housewife, but not very open and warm loving. which shows her ability to bully the others into not telling the truth, she also makes them feel intimidated because she commands them to obey her, "tell them we danced....no more" her authority is clearly outlined here, the others are scared since they are aware that if they refuse, they will suffer dire consequences. The puritan's extreme religious rules and view and consequently the same restrictions suggested by the author in relation to communism are a key reason as to why Abigail lies and consequently the hysteria which continued to develop. 'The Crucible' opens into the Reverend house with his daughter Betty lying in bed, inert. Throughout the play her motives are never really complex her main aim is to gain revenge on the Elizabeth Proctor as she is extremely jealous after John Proctor refuses to continue their relationship. In act one Abigail is the key character in the play with her actions showing that she is very dominant. 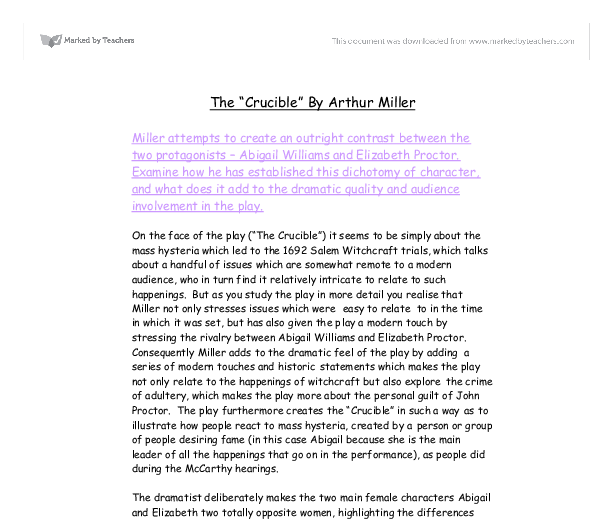 The Crucible by Arthur Miller - Abigail Williams - Character Study. Abigail is unable to see that she is only helping to satisfy a lustful mans appetite, she thinks that John holds some intimate feelings towards her. This flaw in her character ironically turns out to be a major weapon in her diabolical mission as her accusations carry the weight of simplicity and apparent naivety.